Carla J. Hanna lived in Santa Monica, CA where her children played with the children of celebrities. She mingled with plenty of nannies and a few good celebrity moms. Her award winning books, The Starlet Series, are available through Amazon.com. Starlet's Web, book one of The Starlet Series by Carla Hanna is a memoir of fictitious Hollywood teenage starlet Liana Marie. Seventeen-year-old Liana is on top of her game and has an Oscar to prove it. However, her success, like several in Hollywood, has a big price tag. It is not easy balancing the life of being a teenager and being a big star. She is trying to live her life the best way she can, hooking up with some cute boys along the way, and fighting off unwanted advances. Then she realizes that she is and always has been in love with her best friend, Manuel, a boy she has known since childhood. Fortunately, Liana has her mum, who has been in the same business for a long time, to guide her; that is, until her mother's best intentions have catastrophic results. Starlet's Web is a captivating story about the life of Hollywood teenage star and the price she has had to pay. Carla Hanna created a sweet main character who can do no wrong, a girl suffering the consequences of the need to keep up with the Hollywood standards and expectations. She is a kid who has messed up before but now knows better. Carla Hanna's style of writing is very eloquent and evokes vivid images. I could not help but fall in love with Liana as she struggled to stay grounded and fight the temptations that come with the Hollywood life. The book gave me a whole new take on Hollywood stars; their lives are not just about the glitz and glamour. Starlet's Web by Carla J. Hanna is about young Liana Marie Michael, known as Marie through most of the book, who struggles to be like other teens while being a very successful actress. Marie wants to be normal and doesn't enjoy most of her acting career, but loves other parts of her job. Marie goes through more than a normal teen would but, while struggling to be herself, she finds that she can be true to herself and still make herself and those she loves happy. When life takes a turn for the worse and disaster strikes, Marie learns who is really there for her and starts to see what she wants out of life and how she can be more than she ever thought she could be. Starlet's Web is an addictive and very enjoyable book that was hard to put down. There were a wide range of characters, from the amazing actress with a long career ahead of her to the failed actress who is putting her life back together, and then those who want power and go about trying to get it in any way that they can. To me, Starlet's Web showed the true dynamics of what Hollywood probably is. Throughout Starlet's Web, I watched Marie grow up and mature, and go through betrayal the likes of which I couldn't even imagine and still come out strong and on top. That makes Starlet's Web an inspiring story. Definitely looking forward to reading the next books in the series. Starlet's Web (The Starlet Series, #1) by Carla J. Hanna takes us into the life of Liana Marie Michael, a 17-year old A-list actress. Liana is struggling with the obsession that Hollywood has with youth and power, and this obsession is set to destroy her future. As if the struggles of Hollywood were not enough, Liana has to handle what every other young women her age does: issues with boys. She is dating a Hollywood heart throb named Byron, but there is tension between her and a boy from her school named Manuel. Life is chaotic and Liana needs to learn how to cope ... will she? Carla J. Hanna has created a fast paced, enjoyable novel for YA readers. Because of some of the language used I would suggest the older side of YA readers. The plot of this book is fun and very current. I think everyone knows there is a general obsession with Hollywood and I have often wondered how the younger actors and actresses cope. This is fiction, of course, but well written and you can see some of this playing out in real life. Liana is a character that I think even the non-Hollywood people like myself can relate too. At the core, she is just a young woman who has struggles like the rest of us. There is more responsibility on her shoulders than most young adults her age. I was not much of a fan of Byron personally and loved the “normal” guy Manuel. All in all, I give this book thumbs up and I am glad it is a series because I cannot wait to read the next one. 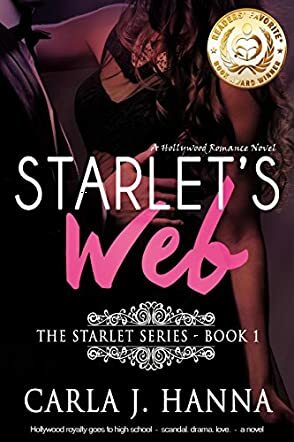 Starlet's Web by Carla J. Hanna is the first book of her Starlet Series. It introduces you to Marie Michael, an up and coming and quite talented actor, who dreams of being a normal teenager amidst the glitz and glamour of a Hollywood lifestyle. Being a teenager in Hollywood is rough, with schedules and rules to follow. She detests the cameras catching her every move, the tight dresses she wears at premieres, and the mask she wears even at times when she's supposed to be herself. Surrounded by hot and gorgeous actors, all she wants is to be loved by her best friend, whom she's known for years - Manuel, a young half-Latino who's very far from the Hollywood lifestyle. With her actress/producer Mom, who expects her to be the perfect actress, and her Dad, divorced and with his own family, wanting her to be just a normal girl, it takes all of Marie's strength to be herself and have friends. What she doesn't know is that the entertainment industry is exactly as she described it, a web, and she is all three - spider, fly, and web. What I like most about Starlet's Web is that Hanna was able to create a character who's very much a teenager faced with real life adult problems, and Marie's reactions to those problems are very realistic. Hanna writes a strong protagonist, who needs help still, and a heroine who is able to judge her own actions as well as others. The glitz and glamour of a Hollywood lifestyle is quite well written, too, and I'm sure most readers will enjoy a glimpse of what's behind the cameras and what it might feel like for those actors who may not be ready for the lifestyle and the consequences of actions. It's raw and very engaging, and I personally can't wait to read the next installment.